Please scroll down to read the entire commentary for free online. If you would like a free downloadable PDF, ODT, or WordDoc copy, please click the links below. Thank you! I, a soul, am a lay daughter of the Catholic Church, who loves you very much. I pray for you each day, especially, that you will fulfill the Will of God and for your eternal salvation. I am just one of many billions of people around the world who also care deeply about you and are praying for you and for your eternal salvation. God bless you, Holy Father. I will be very frank. I know that you likely had a very poor, even hellish, experience during the Great Warning (Illumination of Conscience) from Our Good God. I also know that many people also had a hellish experience, so you are very much not alone. I love you and I do not judge you. I am simply stating facts. Holy Father, I am speaking only the Truth to you. It is important that you listen to my words and act upon them, because I am speaking only from the heart—the Most Sacred Heart of Our Lord, Jesus Christ. You are on the wrong path and you are taking the Catholic Church and many millions of souls along with you on the wrong path. The path that you are taking leads only to eternal damnation in the unending fires of hell. Jesus does not condemn you at this time. Jesus wants your experience of the Great Warning to be your wake-up call to the Truth, as well as the wake-up call for the like-minded souls who are surrounding you and are misguiding you. Jesus only desires to save you and every like-minded soul. Please let the Great Warning be your wake-up call to change, repent, and live solely for God and His Divine Will. Please let the Great Warning be the miracle of Divine Mercy that Jesus desires it to be for you. It is a special grace and will be a true blessing for you if you only open your heart to God. Holy Father, you are the false prophet of Revelation. The false prophet is the second beast of the Apocalyse as revealed in Sacred Scripture. Please listen very carefully to my words. hell is real and does exist. hell is horrific and eternal. satan is real and he does exist. satan hates God and satan hates you because you are a beloved child of God. satan’s only desire is your eternal damnation and the eternal damnation of every soul that you bring along with you to hell. Your eternal damnation is a great trophy and a great victory for satan. As the false prophet, you would join the same eternal fate of Judas Iscariot—who is subject to an unending torture unimaginable and inexpressible in words. Judas is the ultimate prize and plaything of satan. Holy Father, please listen very carefully to my words. Our Heavenly Father Is granting you a “Last Chance” for eternal salvation through the Holy Tears, Supplications, and Intercession of the Blessed Virgin Mary, Queen Mother of Peace, the Immaculata, Our Lady of Fatima. Jesus and Mary love you very much and They do not want your condemnation. With All the Strength of Their United Hearts, Jesus and Mary want you to know that you do not have to be forever known as the false prophet in hell. With All the Strength of Their United Hearts, Jesus and Mary want you to be forever known as the Greatest Example of Jesus’ Divine Mercy in the world. But, this reality is only possible if you repent, change, and convert back to God and His Divine Will for you and His One, Holy, Catholic, and Apostolic Church. Our Lady wants you to remember your first call to be a priest for Her Son. She wants you to recall the great passion you had for the Most Holy Eucharist and for serving Her Son’s Church. As the Greatest Example of Jesus’ Divine Mercy, you would give God untold Glory. God loves you very much. Now, The Holy Spirit desires that I reveal to you a little about myself. Holy Father, I, a soul, know how hard it is to fully change the direction of one’s life. In 2003, I had it all by worldly standards. I was entering my final year of law studies at a prestigious university in the United States. The prior summer, I was selected to be one of three law interns working on the first international treaty of the World Health Organization. My intention was to return to Geneva, Switzerland, after graduation, to work for the United Nations. I was agnostic (a practical atheist) and held very liberal views. I believed in abortion, birth control, euthanasia, etc. Basically, everything that opposed God’s Commandments. The man that I planned to marry was a Democrat who worked in the U.S. Congress in Washington, D.C. So, I was looking forward to being a politician’s wife and was having much success in life. Then, something happened. Through a powerful intervention solely due to Our Lady, I discovered God in the Catholic Church that I had been baptized in as a baby. Holy Father, I read my way back into the Mother Church. I discovered the beauty and logic of the ancient truths in the Catholic faith. I also discovered that I was a great sinner who needed to reconcile herself back with God. Holy Father, I had to give up everything to follow the Gospel. I was asked the ultimate question. I was made to choose between getting married and raising a family, or loving God and His Commandments. I chose God and walked away. I radically changed all my beliefs and I gave up a career as an international lawyer, because I knew if I continued down the path that I was on that I would ultimately lose my soul. The path that I was headed on was a dead end in hell. I surrendered everything to God. I gave Him my heart. I gave Him my mind. I gave Him my soul. I even surrendered my intellect to God, because when I discovered the beauty and logic of the Gospel, I realized that most of what I had been taught in school were lies, like evolution and global warming, etc. Holy Father, you must repudiate the United Nations Agenda 2030 and all similar works that are conceived in hell. I worked on an international health treaty. I was privileged to see many confidential documents of several environmental treaties that were used as the framework for the health treaty. Papa Francis, even back then when I was a practical atheist, I knew that something was wrong about these treaties—I just could not identify what it was. Papa Francis, the United Nations talks about rights of indigenous people on one hand, but on the other hand, they are stripping all the natural rights of self-determination that God has given to all nations to grow and prosper. Much of what the United Nations does is evil and simply a mechanism for the antichrist. Holy Father, I reveal these things to you, because you are being asked the ultimate question now: God or satan? You need to surrender everything to God and radically change the direction of your life. By God’s grace, you can do this. I know this, because I am living proof of this truth. I want you to be saved and not condemned to hell. Holy Father, in 2011, I had a mystical experience that the Holy Spirit desires that I share with you. One day, I was receiving visions of human history and I began to feel extreme sorrow in my heart at the state of the world. Then, the visions got closer to the End Times and the sorrow deepened, until finally, I cried out to Jesus, please I cannot bear to see the Apocalypse. Please, with all of my heart, please rip out the bad pages of the Apocalypse, so we only have the good stuff. Please, Jesus, You Are the Author of the Book of Revelation. Surely, You can rewrite the Apocalypse and open up the Book of Life, which is Your Most Sacred Heart, to everyone. Surely, All Things Are Possible To God? But, Jesus never told me if He would change the Apocalypse. Instead, Jesus whispered in my soul that He will never walk again on this earth in the flesh. Then, I was viciously attacked by satan, and in the midst of my great struggle, I sinned against God. It then took all my will-power to resist the heightened seductive powers of satan, because he was trying to get me to commit suicide by running out into the street and jumping in front of a car. By God’s grace, I resisted the temptation, but it was really quite awful. Then, I experienced in my soul the deprivation (loss) of God that the poor souls in purgatory feel all the time for my sin against God. Holy Father, I have experienced much physical, mental, and spiritual pain, in my life. But the deprivation (loss) of God that I felt in my soul was the worst torment that I have ever had. All I wanted to do was sit on a stool before the Blessed Sacrament and cry for the rest of my life. The pain was so torturous—I would never want anyone to feel such pain—the loss of God. Finally, Holy Father, after a few days, I made it to Confession and I thought the pain would go away. But, the torment did not subside. I stayed for vigil Mass after Confession—all the while, begging God to take the pain away. I had hope that the pain would go away at Holy Communion, but it continued. Holy Father, I was adamant. I was not going to leave my parish church until God alleviated my spiritual suffering. I prayed for over 45 minutes in Holy Communion begging for God’s help. Then, as I was praying with my eyes closed, I began to hear the sounds of history go by. I heard the sounds of war and the sounds of peace, etc. It seemed like God was permitting me to hear all the sounds of mankind throughout the ages as he has been exiled on earth. Then, I felt a sinister touch on my shoulder, which startled me a lot. I then found myself, in body and in soul, at a different Mass at my parish church. I witnessed, in body and in soul, how the Holy Mass would be changed in the future, and I saw the Abomination of Desolation. And when I saw the Abomination of Desolation, I quickly fled the building as it was horrifying. Holy Father, the Book of Truth was spoken about by a Holy Angel to the Prophet Daniel in Sacred Scripture. The Angel told Daniel that the Book of Truth is sealed until the End Times and would be only opened by the Lamb of God. Holy Father, the Book of Truth has been finally opened and revealed to the world by Our Lord, Jesus Christ, to 7th Messenger, Maria Divine Mercy. Holy Father, the Book of Truth is all about you, Papa Francis, as the false prophet. It speaks about the great apostasy and how the antichrist will enter the Catholic Church. It speaks about how the Most Holy Eucharist will be replaced by the Abomination of Desolation. It speaks about how the Holy Mass will be adapted beyond recognition becoming occult and satanic in nature. It speaks about how the Holy Bible will be replaced by satanic literature. Holy Father, you must read the Book of Truth and recognize the Voice of the Holy Spirit in the Holy Words of Our Lord and Our Lady. Further below on this webpage, I have placed download links to the Book of Truth, as well as prophecy summaries that I created about the antichrist and the false prophet, and a special commentary about the antichrist as a demon incarnate—the spawn of satan. I urge you to download them and to read them, because you need to fully recognize the path that you are on and where you are leading the Catholic Church. You are on the wrong path heading towards hell. Holy Father, please understand that you are THE ESSENTIAL CHARACTER to satan’s demonic plan to bring damnation to every living soul on earth. Without your free-will cooperation, the antichrist will be unable to enter the Catholic Church. Without your free-will cooperation, the antichrist will be unable to manifest all the supernatural powers of satan on earth made possible only through worldwide worship in the satanic mass. satan truly hates you and only desires to use you to bring about the collapse of the Catholic Church, and, in turn, the world. Without your free-will cooperation, satan will be defeated. Holy Father, I do not mean to frighten you, but it is only by accepting the Truth—that you are the false prophet of Revelation—that you will be able to be saved by correcting yourself and your errors so you can seek full reconciliation with God. If you deny the Truth, you will never gain unity with the Divine Will and understand the Divine Plan of Our Heavenly Father. If you deny the Truth, you will never see the Holy Face of Our Heavenly Father. Jesus and Mary are ready and willing to pour the greatest graces into your soul and true love and true peace into your heart, but you must accept the Truth and decide for God. There is no other way for salvation. Holy Father, it is solemnly decreed by Our Heavenly Father that there can only be one pope living at a time on earth. Our Lord, Jesus Christ, has stated that each pope must preside until his death. Yes, Papa Francis, you are an antipope, and very seriously, you are the false prophet of Revelation. But, Our Heavenly Father tenderly loves you while also respecting the free-will of His beloved children on earth. And so, Our Lord has provided me with a list of tasks that He desires that you and Pope Benedict XVI accomplish together. It is called, “The List of Necessary Steps for the Catholic Church to Usher in the Triumph of the Immaculate Heart, the Great Era of Peace, and to Avert the Great Chastisement.” It is further below on this webpage. Our Heavenly Father Is willing to counter-match the horror of satan—forever known as the false prophet in hell—with the choicest grace of His Paternal Heart. If you accomplish all the tasks on the list, you will have the everlasting legacy as one of the greatest popes ever in the history of the Catholic Church. The future generations will forever thank you for bringing about the Kingdom of the Divine Will—the New Jerusalem—on earth. Our Heavenly Father Is truly hoping for a New Pentecost under your leadership. It is your free-will choice to decide. I want you to know that, despite the hurt and sorrow in Their United Hearts about the present-day situation of Two Popes and your current actions as the false prophet, Jesus and Mary hold only real love and heavenly hope for you. I want you to know that, in the days after you were chosen pope, both Jesus and Mary looked beyond into the future to see your finest potential as a beloved child of Our Heavenly Father. Both Jesus and Mary see a future reality in which you will accept the Divine Will and will fulfill the special mission that Our Heavenly Father has entrusted to you. Would you like to know what Jesus and Mary said in the days after you were chosen pope? I was especially touched by Our Blessed Mother’s words about your hands, Papa Francis. In my eyes, that is the greatest of compliments by Our Beautiful Queen, as it is only through your holy consecrated hands that we, the faithful, receive Her Son, Our Lord, in the Most Holy Eucharist. How dearly Our Blessed Mother truly loves you, dear Papa. I love you, too, along with all the faithful. I want you to know, Papa Francis, that many Christians and many people of good-will are praying for you. In truth, billions of people are praying for you right now, so you will make the correct decision to repent and live for God and His Divine Will. In truth, billions of people are praying for your eternal salvation and that the gates of hell will not prevail against the One, Holy, Catholic, and Apostolic Church founded by Our Lord, Jesus Christ. Billions of people are being baptized, repenting in Confession, and returning to the Mother Church. Billions of people are praying for you right now, so the Great Tribulation will be mitigated by God, and so, we, the beloved children of God can have the New Pentecost on earth. Holy Father, I know that you are thinking many thoughts and experiencing many emotions right now. I also know that satan and all of hell are working their hardest for you to fall by rejecting your mystical experience of the Great Warning, the contents of this Appeal, and the testimonies of the visionaries of Medjugorje and Garabandal about the Great Chastisement. God Is Greater than all the weaklings of hell. Our Lord Is All-Mighty and All-Powerful. Our Lord knew fully well that you would be plagued by many doubts, confusion, negative thoughts, and bad acts caused by satan in the aftermath of the Great Warning. Our Lord and Our Lady have a Great Plan for you and for the salvation of the world. Holy Father, within the year of the Great Warning taking place, in the Springtime, there will be a Great Miracle performed by God in Garabandal, Spain. It will be announced by visionary, Conchita, eight (8) days in advance. Although the Great Miracle will be able to be televised, I know that God wants you to be physically present at Garabandal for the Great Miracle. In truth, Our Heavenly Father commands your presence and the presence of Pope Benedict XVI at the Great Miracle. Our Lord wants you both to witness the Great Miracle in person so you both will have no doubts about the contents of this Appeal. God and Our Lady desire all tasks to be completed so the world will be adequately prepared for the Second Coming of Our Lord, Jesus Christ. Our Heavenly Father and Jesus desire that every soul enter the New Paradise of the Great Era of Peace. The Second Coming will take place during the lifetime of this generation on earth. Only Our Heavenly Father knows the exact Day of His Divine Son’s return to earth in the clouds. I also only know that if the contents of this Appeal are successful, that 7th Messenger and Final End-Time Prophet, Maria Divine Mercy, will be given the special privilege by Our Heavenly Father, of announcing the Day of the Second Coming shortly before it happens. Holy Father, I know what the Great Miracle and Great Sign of Garabandal are. These Secrets were revealed to me earlier this year by St. Gabriel the Archangel. I was also told that there is enough grace attached to the Great Miracle and Great Sign to convert the entire world back to God. satan and all of hell fear the great loss of souls around the world who will instantly convert due to the Great Miracle and Great Sign. satan is desperate and wants to start a nuclear war so the world will not survive until the time of the Great Miracle. satan will try anything to stop you from witnessing the Great Miracle in Garabandal, because the Great Miracle IS the Triumph of the Immaculate Heart of Mary and IS the Promise by Our Lord, Jesus Christ, that the gates of hell will never prevail against the Catholic Church that He founded two thousand years ago. Papa Francis, I beg you. You must physically witness the Great Miracle in Garabandal and see the Great Sign left by God. You will no longer have any doubts about God and His Holy Church. It will be your greatest joy as a Jesuit priest. You will be touched by God’s Love and you will rediscover your first call to be a priest and your first love for the Lord. You will be renewed in your heart and will complete all the tasks asked of you by God and Our Lady. Please go. Papa Francis, I have created this webpage on my blog, MaryRefugeOfHolyLove, out of love for you. This webpage has this Appeal along with heavenly messages from Our Lord and Our Lady. This webpage also has a few videos for you to watch and several worship songs that I especially chose for you. I want you to know that I have been singing to each and every single one of these love-songs for your conversion and eternal salvation. I love you and I do not want your condemnation. Papa Francis, We, Heaven and earth, are all praying for you, for your eternal salvation, and the renewal of the Body of Christ. We can have a New Pentecost, Papa Francis, under your pontificate. All it takes is your complete surrender “yes”—your own fiat to the Lord. God bless you, dear Papa Francis, with the Complete Blessing of the United Hearts of the Most Holy Trinity and the Immaculate Heart of Mary. Amen. Thank you, Holy Spirit, for your inspiration. Thank you, Blessed Mother, for your loving and constant intercession for me. A special thank you to St. Catherine of Siena, St. Francis of Assisi, St. John Vianney, St. Peter, St. Joseph, St. Michael the Archangel, and the Guardian Angel of Pope Francis. A special thank you for all the people on earth who intercede and pray for me and the success of the blog. Amen. May I always love You. If His Holiness, Pope Francis, rejects the mystical experience of the Great Warning (Illumination of Conscience), the contents of this Appeal, or the testimonies of the visionaries of Medjugorje and Garabandal about the Great Chastisement, God will permit Pope Francis to be brought to the brink of death by the power of satan. He will have a near-death experience involving satan disguised as an angel of light. The angel of light will lie by explaining that the Great Warning is a necessary step for the purgation of all sins of mankind and that he was shown the destiny of hell for all those who deny Jesus Christ who presently walks the earth at this time. Pope Francis will be told that the man who negotiates a peace treaty in the Middle East for the nuclear war will be Jesus Christ returned in the flesh. However, this man who walks the earth is in reality the antichrist. The antichrist is the Jesus of the Koran, who has been prophesied in Islam to return in the End Times to “break all crosses.” The antichrist will appeal to Christians, because he will be well-versed in Holy Scripture, which he will use to twist its meaning backward, uniting all religions in New Age/Islamic ideology. The angel of light will twist the truth by telling Pope Francis that, just like St. John the Baptist, he is the forerunner chosen by God to announce and prepare the faithful for the Second Coming of the Lord. Then, Pope Francis will be healed by satan and afterwards, will manifest supernatural gifts and miracles—all by the powers of satan—to prepare for the coming of the antichrist. However, at the point the Most Holy Eucharist is finally removed (the Abomination of Desolation), the Vatican will burn, because God will not allow the antichrist to sit on the Chair of St. Peter. A new temple will then be built in Rome, which will become the seat of the antichrist of the newly-formed Babylon (the European Union in union with the false Catholic Church). If His Holiness, Pope Francis, finally realizes the errors of his ways—the Truth of the Great Warning (Illumination of Conscience) and the Truth of this Appeal during the near-death experience, God will save his soul but he must totally reject satan and totally surrender his free-will to God and cry out for Jesus and Mary. It will be difficult because satan will be present before him and manifesting all his seductive powers at that moment, but God’s Mercy Is So Great that He will grant this special intention of Our Lady for his eternal salvation. The faithful must pray for him and not lose hope. All Glory Be To God! God, Our Heavenly Father, commands the physical presence of His Holiness, Pope Francis the First, at the Great Miracle of Garabandal. The Great Miracle will put to rest any doubts, confusion, and negative thoughts and actions that satan will use against Pope Francis to convince him to reject the mystical experience of the Great Warning (Illumination of Conscience), the contents of this Appeal, and the testimonies of the visionaries of Medjugorje and Garabandal about the Great Chastisement. If Pope Francis is physically present at Garabandal and witnesses the Great Miracle, it will be his greatest joy as a Jesuit priest and it will radically transform his heart. The Great Miracle will confirm everything that I have requested on behalf of God and Our Lady in this Appeal, which Our Heavenly Father expects Pope Francis to complete in its entirety after the Great Miracle takes place. Under the guiding hand of Pope Benedict XVI, reverse all changes that are not in conformity with Church Tradition, Doctrine and Dogma. God wants His Church restored (Official Catechism under Pope St. John Paul II). God wants the Holy Dignity of the Most Holy Eucharist restored as the Most Sacred Heart of the Body of Christ. The Holy Mass should be the center of daily Christian life. Declare a Year of the Triumph of the Immaculate Heart of Mary. Dually consecrate with Pope Benedict XVI and all Catholic Bishops the nation of Russia to the Immaculate Heart of Mary after a 5-month period of preparation by the entire Church (Five First Saturday Devotion). This consecration will avert the nuclear war and usher in the Triumph of the Immaculate Heart. Reveal the entire Third Secret of Fatima to all the faithful. There must be a public repentance of the leadership of the Catholic Church for the failure of not revealing the Secret when God and Our Lady desired. Dually proclaim with Pope Benedict XVI the Fifth Marian Dogma of Our Lady as Advocate, Co-Redemptrix, and Mediatrix of All Grace. Embrace the spirituality of the United Hearts of the Most Holy Trinity in Union with the Immaculate Heart of Mary at Holy Love Ministries (http://www.holylove.org) as part of the Official Teaching of the Magisterium of the Catholic Church. Lead all the faithful in pursuit of this spirituality. God desires that all nations, all parishes, all families, all individuals consecrate themselves, their communities, their workplaces, their governments, their schools, their places of entertainment and recreation, etc., to the United Hearts of the Most Holy Trinity in Union with the Immaculate Heart of Mary. These consecrations will serve as public exorcisms returning much that been given over to evil back to God. Also, the Ten Commandments should have a place of prominence in all homes and public places. The Holy Innocents—over one billion unbaptized unborn children are stuck in Limbo. The Holy Innocents—Past, Present, and Future—must be spiritually Baptized and receive the Sacrament of Confirmation, so they can be released into Heaven and gain the beatific vision. Purgatory must be closed at the Second Coming of Our Lord, Jesus Christ. The faithful must be taught about how to offer daily prayers, sacrifices, and indulgences, so these billions of poor souls can be released into Heaven and gain the beatific vision. This is an corporal act of Mercy and Holy Love. There must be public repentance by the entire Church for the neglect, sacrileges, and other crimes against the Most Holy Eucharist during the past two thousand years. The entire Church needs to repent on behalf of all mankind for all the collective sins that have been building up throughout the generations since the Fall of Adam and Eve. The entire Church needs to offer the Most Precious Body and Most Precious Blood of Our Lord, Jesus Christ, to God Our Heavenly Father in atonement for all these collective sins. The Secret of the Great Chastisement must be taken seriously by the entire Catholic Church. The Great Chastisement is conditional and can be mitigated and even averted, but there must be massive conversions to God, turning away from all sins through Holy Love, and restoration of the Ten Commandments to all aspects of life. If all these steps that I have outlined are done, Divine Justice will be mitigated and the Great Chastisement possibly averted. God Is also willing to mitigate the remaining Nine Secrets of Medjugorje but it all depends on human response to the pleas of Our Lady for conversion and repentance. The scales of Divine Justice must be balanced. This is only possible by atoning for all sins—individual and collective—past and present—before Our Heavenly Father by offering the Most Holy Eucharist to God imploring His Divine Mercy and Divine Love instead of His Divine Wrath. Holy Love and Our Lord, Jesus Christ, in the Most Holy Eucharist, is the ONLY SOLUTION to avert the Great Chastisement and to mitigate the remaining Secrets of Medjugorje. Let It Be Known that this Last Chance from God Our Father for Pope Francis the First Is Solely Made Possible through the Holy Tears, Supplications, and Intercession of the Blessed Virgin Mary, Queen Mother of Peace, the Immaculata, Our Lady of Fatima. Amen. Let It Be Known that Our Lord, Jesus Christ, Is extending His Hand of Mercy and Friendship towards Pope Francis the First and all like-minded souls as His Primary Desire Is for the Eternal Salvation of all living souls made possible only through His Holy Living Sacrifice, The Passion and Crucifixion, at The Cross. God, Our Lady, and All of Heaven stand ready and willing to bless the pontificate of Pope Francis the First for the New Pentecost. The choice is left up to Pope Francis for eternal life and not condemnation as the false prophet in hell. Amen. I, a soul, write these final words under strict obedience and authority given to me by God, Our Heavenly Father, and Our Lady. Amen. The votes have been cast. The pope has been chosen. “What will be the new direction?” everyone asks. That is not the question, nor do the answers to that question have great significance. It is not the direction that the Church takes, but the impact the Church makes upon the world that truly matters. Too much is made of internal policies and decisions. The real question is whether the Church is a light to the world? Can the Church’s light dispel the darkness and can the Church’s voice again be heard in the market place? So much needs to change and the task is so daunting. Time and again I come back to this point of the consecration of Russia. I wait for it and I will continue to wait. When it is done, I will pour out my gifts. Before it is done, the gifts cannot be released. What is withheld cannot be delayed for long. The Holy Father must move ahead. When it is accomplished, the blessings of heaven that are still in my heart will pour out, first in the hearts of the Russian people and then all over the world. His first steps will be hesitating and slow but as my light grows in his heart he will see more clearly why I have raised him up. He will see vistas that are hidden from other eyes. He will see with my eyes and more important, he will love with my heart. As he understands the special graces of his new office, he will act more boldly, correcting what needs to be changed and elevating those who have great gifts to offer the Church. All of this, he will do in the normal course of his office, the tasks that he is expected to fulfill. However, I will lead his eyes elsewhere, to far away shores, for he has come from a distant land. His heart will be missionary and his mind will be on many parts of the world that are not developed. He knows the value of planting missionary seeds, even when the harvest will not be in his lifetime. Oh, so very much for him to do. Let him choose carefully those who will surround him as his helpers. He is close to my heart, a child of my love and I will be with him throughout his papacy. He will move ahead and advance my cause. He will speak about me and proclaim my name and my titles. I will lead him further and further into the mystery. Much he does not yet see, but his heart is open to me and I will teach him much. As he gives his heart fully to me, I will exalt him. Only in this way, will all my blessings pour out. Quickly, all the problems of the world will fall upon him as a burden that he will carry for the rest of his life. He will come to me now as my Vicar, the one chosen to lead my Church. I will not forsake him nor allow his footsteps to falter. I will strengthen him and give to him those who will support him. How important are the choices that he will make of those who will surround him and share in his ministry. This is enough. I have spoken clearly. He will be a strong rock, part of the constant foundation of my Church down through the centuries. When his papacy is completed, the great bridge will also be completed and the foundation will have remained firm during so many years of turmoil in the world and the Church. I bring these teachings to an end. The Church has gone through a needed transition, ready for the final years of preparation. Like a house made ready for a coming storm, so have I made my Church. The great storms are already on the horizon. All will see this period, begun by the resignation of Pope Benedict, as a time of God’s divine providence. Benedict had guided the Church with a steady hand. Francis’ hands and heart are so similar to Benedict’s. The rock of Peter will now enter into great storms. These are not internal storms within the Church but the external storms that will come upon the modern world. I want my Church to be ready. How helpless is mankind, especially when he exalts himself and trusts in his own powers. Then, his foolishness is evident to all. Only one approach to God is successful – when hearts are humbled yet confident in God’s goodness. The Father constantly holds back the evils that one nation could inflict on another. He is always destroying the plans of those who would ruin other nations. The world does not see what would have happened without the constant intervention of God. This is what I want to reveal. Long ago, your civilizations would have been destroyed and your people reduced to untold poverty, except that the Father has not allowed this. Time and again, mercy has triumphed over justice and forgiveness over retribution. Still, man does not see the need to come to God. All is becoming secular. Man’s religious spirit is drowned in all the inventions that vie for his time and all the concerns that consume his heart. When will his heart turn back? No one knows the secrets of human history – the wars that could have been avoided and the sufferings that did not need to happen. Mankind is again at an important moment. Wars are everywhere. However, they are little wars, regional wars fought by people against their governments or one group trying to gain an advantage over another. The great powers are not included and the powerful destructive weapons still sit unused. How long will this continue? How long will Satan be satisfied with these little fires? “No need to turn to God. No need to invoke him” are the thoughts of many. Only a few are on their knees. Only a few see the urgency of turning to God. When will the hearts be touched and the eyes of the nations be opened? When will a people cry out with all their hearts, day and night, seeking heaven’s help? You, who understand and see, begin now to call out. Gather as with one heart. Lift up your voices, together and continuously. These are the prayers that heaven hears. Each person has a role to play, a little part in the divine drama. Yet, each is free to say “yes” or “no”. They can reject that part and assume another. When this happens, then the divine drama of human history also shifts. The Father must introduce new elements. Although each person is free to accept or to reject their role, human history must be fulfilled for the glory of the Father and for the happiness of mankind. So much shifting has happened. So many have assumed roles that were not given to them from heaven. Human history is now a confusing picture, filled with every kind of evil. Yet, day by day, the Father’s purposes are being fulfilled. Do not look at the surface of human events because this does not reveal the deep and hidden forces that are at work. There are two kingdoms, locked in an eternal conflict that unfolds every minute in every person’s life and in all of history. The prize is the human person himself and his eternal destiny. This prize is so great that nothing must be spared to win. So, the Father sent me into the world and I was obedient even to the cross. Such is the value of each human person. If I am so interested in the eternal destiny of each one, can I not ask that each person also be interested in their eternal destiny. So much is at stake but this eternal goal is set aside, ignored and endangered. O reader, I died for your eternal destiny. Do not throw away the prize of victory. So many souls are lost. I say this so that those who still live on earth will use the means that my Son has provided. O reader, when was the last time you confessed your sins? When was the last time you even examined your conscience? Or, the last time you assisted at mass? These are the usual steps, the normal means to save your soul. Use them and I will show you the other steps that you can easily take to gain your eternal salvation. The gospel accounts of Jesus’ passion and death reveal his greatest sorrow. He could not hold back the words, “One of your will betray me. Better if that man had never been born”. Today, I reveal my deepest sorrow. As you enter into the recesses of my heart, you will see empty places. Yes, at the very center of my being, an emptiness exists. Throughout human history, I have chosen some to enter my heart’s center. These were my chosen ones, my very elect. I gave them my choicest graces, surrounded them with every blessing. How I looked forward to receiving their love and blessing them forever. But they walked away and rejected my gift. They rejected my stirrings and abandoned my call. They are my deepest sorrow. O reader, I have revealed my heart to you. I have many gifts to distribute. They were meant for others, but they did not want them. They are yours if but you ask. He bows again and leaves. Synopsis: Encouragement of shepherds of the church (priests and bishops) to tend their flocks in the pattern of the Chief Shepherd (Jesus Christ) – with Divine Love and Mercy – not lording over under constraint of obedience or for self-gain. Tend the flock of God that is your charge, not by constraint but willingly, not for shameful gain but eagerly, not as domineering over those in your charge but being examples to the flock. And when the chief Shepherd is manifested you will obtain the unfading crown of glory. * The apparition site at Maranatha Spring and Shrine. Then the word of the Lord came to Jonah the second time, saying, “Arise, go to Nineveh, that great city, and proclaim to it the message that I tell you.” So Jonah arose and went to Nineveh, according to the word of the Lord. Now Nineveh was an exceedingly great city, three days’ journey in breadth. Jonah began to go into the city, going a day’s journey. And he cried, “Yet forty days, and Nineveh shall be overthrown!” And the people of Nineveh believed God; they proclaimed a fast, and put on sackcloth, from the greatest of them to the least of them. Then tidings reached the king of Nineveh, and he arose from his throne, removed his robe, and covered himself with sackcloth, and sat in ashes. And he made proclamation and published through Nineveh, “By the decree of the king and his nobles: Let neither man nor beast, herd nor flock, taste anything; let them not feed, or drink water, but let man and beast be covered with sackcloth, and let them cry mightily to God; yea, let every one turn from his evil way and from the violence which is in his hands. Who knows, God may yet repent and turn from his fierce anger, so that we perish not?” When God saw what they did, how they turned from their evil way, God repented of the evil which He had said He would do to them; and He did not do it. +-Scripture verses asked to be read by Our Lady of Grace. In October 2012 a recording was made at Our Lady Queen of Peace House of Prayer in the USA, at the conclusion of Holy Mass. 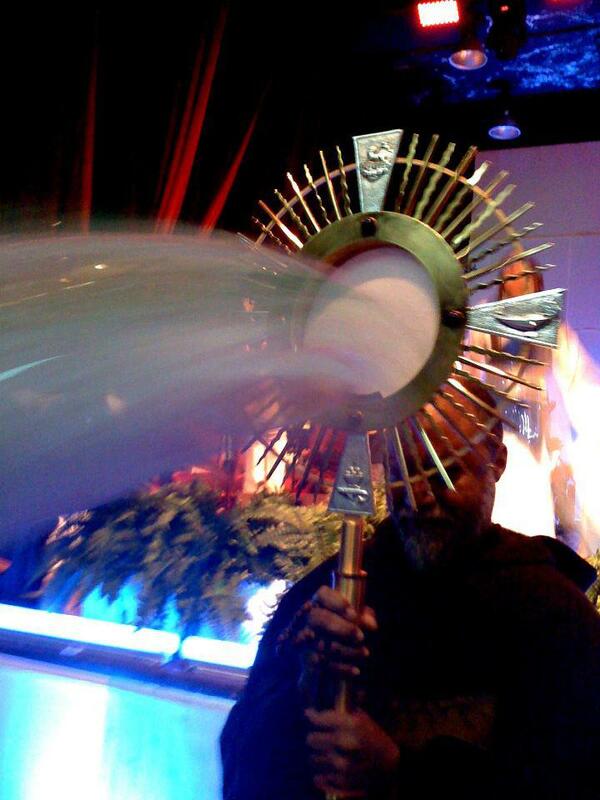 The video recording, only viewed for the first time in June 2013, was found to have a remarkable light coming from the host, pulsating and lighting up the casing of the monstrance. The Very Rev Dr Gerard McGinnity is pictured in the video leading the congregation at Our Lady Queen of Peace House of Prayer in the USA. The Virgin told me that God was going to perform a great Miracle and that there would be no doubt about the fact that it was a miracle. It will come directly from God with no human intervention. A day will come and she told me the day, the month and the year so I know the exact date. It is coming soon but I can’t reveal it until eight days before the date. I am not permitted to say exactly what is going to happen. What I can reveal is that the Virgin said that everyone who would be there on that day would see it. The sick who are there will be cured no matter what their disease or religion. However, they have to be there. The Virgin said that everyone present would believe. They would see that this was coming directly from God. All sinners present would be converted. She also said that you would be able to take pictures and televise it. Also, from that moment on there would be a permanent sign at the pines that everyone will be able to see and touch but not feel. And this sign will remain until the end of time. It seems so near when I think that people are not living the Message, because after the Miracle there may come the punishment. To be complete, there must be the Warning and the Miracle. It is all one message. The Virgin told me of it and made me understand exactly what it will be. Even if I tried to explain it I wouldn’t be able to do it well. It is better that you wait and see it. Noah’s Ark was the sign God sent before the deluge. Before the Chastisement, God will place a Sign at the Pines in Garabandal. It will be able to be seen, televised and photographed. It will be able to be touched but not felt. The Sign will remain in Garabandal until the end of time, a lasting supernatural monument, proclaiming peace or punishment, depending on mankind’s choice of amendment or sin.